Because Diabetes is such a widespread problem, I have composed a Blood Sugar Levels Chart to easily describe blood glucose levels. Diabetes, simply put, is a condition where the body fails to control the hormone insulin properly. Type 1 Diabetes is quite different from type 2 diabetes. I would tell you to measure your blood sugar because if your diet is not in check you might be in warning zone! The chart below applies to those with Type 2 diabetes because it's a disease where glucose, or sugar, builds up in the blood. Put simply, the higher the BGL (Blood Glucose Levels), the higher your chances of becoming diabetic. Remember that diabetes is a disease of diet, and that diet very strongly influences your chances. Before looking at this chart, there are a few things to keep in mind. The glucose levels in the blood are measured in mg/dL (generally). You should measure you glucose levels fasted, or without having eaten any food for at least eight hours. This is because after eating your BGL will increase no matter what. If you do eat it there is a section on the graph that you can refer to where you measure your blood sugar levels 2 hours after eating. Exercise also can raise BGL so measure it without having exercised for at least four hours. Now, you may wonder how to measure blood glucose levels to see if you are at risk. Use a blood glucose meter- this is the most accurate way to check. Put a test strip into the meter and then poke your finger to get a drop of blood. Place the meter on the blood and it will measure your BGL and display it. To see how much at risk you are, refer to the table above and see how your levels compare. So how can the food you eat affect your blood sugar levels? Well, the higher the glycemic index of the foods, the higher the blood sugar impact. I would recommend that the first step you should take to reverse your diabetes or prevent it is to eat lower glycemic foods. However, avoid high fructose containing foods, like agave syrup. Though agave is low in the glycemic index, it is not good for your diabetes because it causes insulin resistance- which is a condition that is linked with excess fructose consumption over a prolonged period of time. This is why I would strongly recommend Stevia , which tastes sweet but does not negatively impacting your insulin levels. You do not want to use agave as an alternative sweetener because it will worsen your diabetic status. In fact, anything containing fructose (including fruits!) will negatively impact your condition. This includes sugar (which is about 45% fructose), and high fructose corn syrup (which is about 55% fructose). These sweeteners are virtually in almost every modern-day sweet treats! Diabetes can be cured! The only thing that you need to do is avoid anything sweet for a bit of time! If you do crave any sweets, try to make your favorite sweet treats using Coconut Flour and stevia. I would tell you to avoid sweet things in generally because there are various studies that link the tasting of sweetness with impacted insulin levels. So there's a chance that you will consume stevia, which metabolically should not impact your blood glucose levels, but still experience insulin fluctuations because the sweet taste itself is what makes that happen! The benefits from curing yourself from insulin resistance and diabetes are endless. You will lose weight, feel better and more energized, and be healthier! You will experience life to the fullest, and I strongly recommend that you take action NOW to change your future! Thank you for reading, and the links for stevia and coconut flour are below. 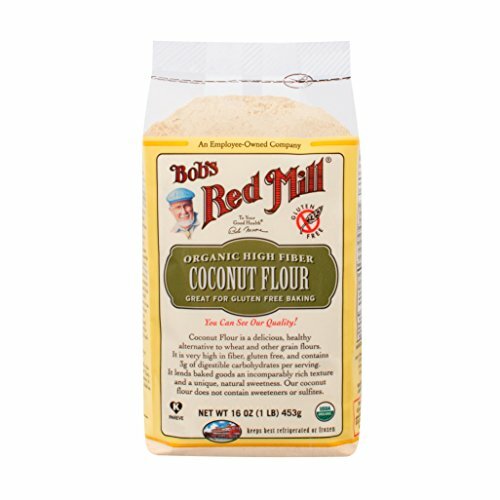 Coconut flour that is gluten free, low in carbohydrate levels, and high in fiber. It is perfect for controlling your blood sugar levels!